I know I say that every new salad I make is my new favourite but truly, this is. I must have made it six times in the last two weeks and still show no signs of getting bored. 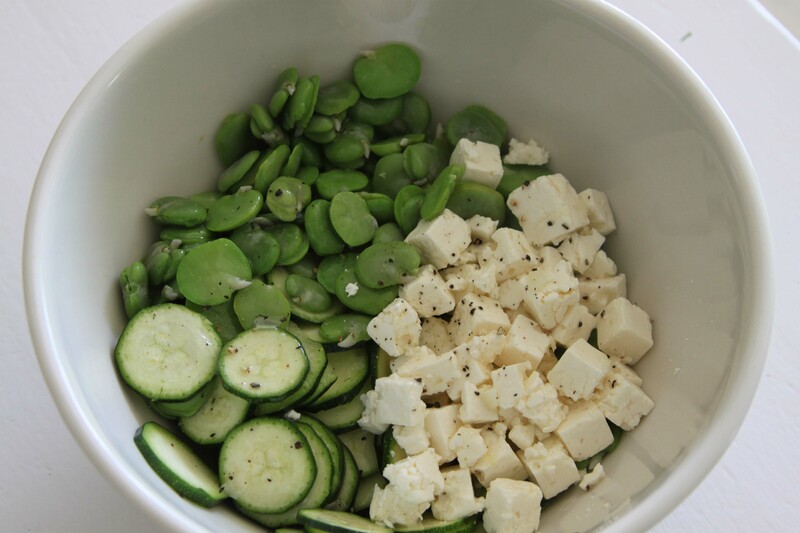 Crunch from little new courgettes go amazingly well with the glorious double podded emerald green beans. A flurry of snow white tangy, salty feta along with a lemony garlic dressing brings the whole thing together with a boom. Completely fresh and seasonal and got to be good for you, what is not to love? I implore you to make this while the courgettes are small and the beans are around. Broad beans might not be everyone’s cup of tea when single podded and served in their sometimes tough, grey outer jackets. This I would concur with, a reminder of school lunches, both chewy and a little bitter. Unrobe them further however, reveal that stunning inner green and you are in for an absolute treat, a true taste of the English summer. I admit you need quite a pile of pods to end up with 200g of the inner bean but it is a job I enjoy, sitting at the table releasing each bean from its cosy padded sleeping bag. A gin and tonic would be the ideal accompaniment to this task and reminds me of sitting with my granny podding beans recently picked from her garden (she had the gin in those days obviously, not me). Granny’s kitchen garden was one of my favourite places in the world and although its been many years since I was there I remember the rows of vegetables like it was yesterday. My first taste of asparagus, artichokes and fennel came from here along with beans of all variety. Fruit trees in one corner offered regular treats when I was wandering around and the strawberries and raspberries further delights if I could negotiate the netting on the fruit cage. It was a dreamy place and the excitement of picking fresh produce has never left me. You will see feta mentioned again and I admit it finds its way into a lot of my salads. If you aren’t keen on it though a little labneh (simply drained yogurt) would be a perfect, less salty alternative or some fresh ricotta (Herby Ricotta, September 2014) a delicious addition. Finely slice the courgettes and put into a bowl. Blanch the beans in boiling water for 2 minutes then drain and run under cold water and drain again. Mix the garlic with the lemon juice, olive oil and salt and pepper, taste and check you are happy with the seasoning but bear in mind the feta can be quite salty. 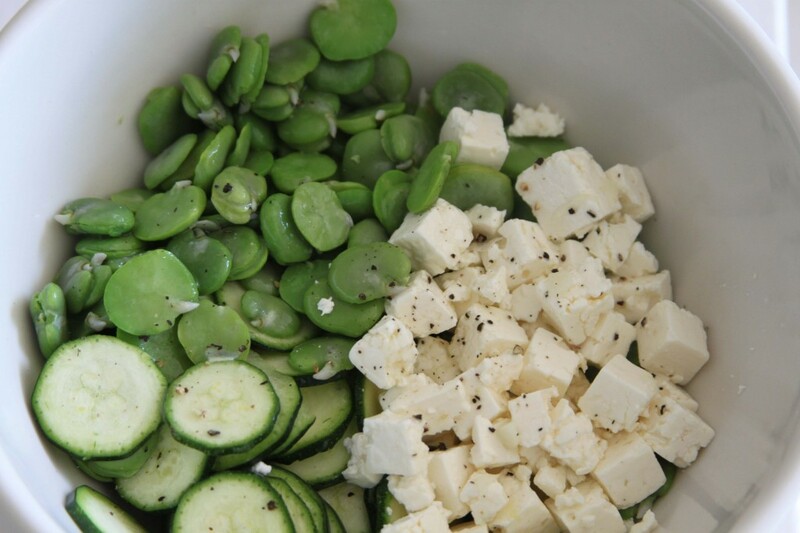 Turn the courgettes in the dressing and make sure they are well covered then add the beans and feta and mix the in gently, sprinkle with herbs and serve. Enough for 4 alongside other things or 2 on its own.